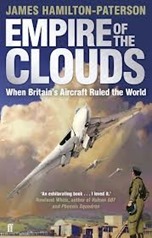 Empire of the Clouds by James Hamilton-Paterson, subtitled When Britain’s Aircraft Ruled the World, is the story of the British aircraft industry in the 20 years or so following the Second World War. I read it following a TV series a while back, name now forgotten, and the recommendation of friend. I thought it might fit with the story of computing during a similar period which I had gleaned from A Computer called LEO. The obvious similarities are that at the end of the Second World War Britain held a strong position in aircraft and computer design, which spawned a large number of manufacturers who all but vanished by the end of the 1960s. The book starts with the 1952 Farnborough Air Show crash in which 29 spectators and a pilot were killed when a prototype de Havilland 110 broke up in mid-air with one of its engines crashing into the crowd. Striking to modern eyes would be the attitude to this disaster – the show went on directly with the next pilot up advised to “…keep to the right side of the runway and avoid the wreckage”. All this whilst ambulances were still converging to collect the dead and wounded. This attitude applied equally to the lives of test pilots, many of whom were to die in the years after the war. Presumably this was related to war-time experiences where pilots might routinely expect to lose a large fraction of their colleagues in combat, and where city-dwellers had recent memories of nightly death-tolls in the hundreds from aerial bombing. Some test pilots died as they pushed their aircraft towards the sound barrier, the aerodynamics of an aircraft change dramatically as it approaches the speed of sound, making it difficult to control and all at very high speed so if solutions to problems did exist they were rather difficult to find in the limited time available. Black box technology for recording what had happened was rudimentary so the approach was generally to try to creep up on the speeds at which others had come to grief with a hope of finding out what had gone wrong by direct experience. At the end of the Second World War Britain had a good position technically in the design of aircraft, and a head start with the jet engine. There were numerous manufacturers across the country who had been churning out aircraft to support the war effort. This could not be sustainable in peace time but it was not for quite some time that the required rationalisation was to occur. Another consequence of war was that for resilience to aerial bombing manufacturers frequently had distributed facilities which in peacetime were highly inconvenient, these arrangements appeared to remain in place for some time after the war. In some ways the sub-title “When Britain’s Aircraft Ruled the World” is overly optimistic, although there were many exciting and intriguing prototype airplanes produced but only a few of them made it to production, and even fewer were commercially, or militarily successful. Exceptions to this general rule were the English Electric Canberra jet-bomber, English Electric Lightning, Avro Vulcan and the Harrier jump jet. The longevity of these aircraft in service was incredible: the Vulcan and Canberra were introduced in the early fifties with the Vulcan retiring in 1984 and the Canberra lasting until 2006. The Harrier jump jet entered service in 1969 and is still operational. The Lighting entered service 1959 and finished in 1988; viewers of the recent Wonders of the Solar System will have seen Brian Cox take a trip in a Lightning, based at Thunder City where thrill-seekers can play to fly in the privately-owned craft. They’re ridiculously powerful but only have 40 minutes or so of fuel, unless re-fuelled in-flight. Hamilton-Paterson’s diagnosis is that after the war the government’s procurement policies, frequently finding multiple manufacturers designing prototypes for the same brief and frequently cancelling those orders, were partly to blame for the failure of the industry. These cancellations were brutal: not only were prototypes destroyed, the engineering tools used to make them were destroyed. This is somewhat reminiscent of the decommissioning of the Colossus computer at the end of the Second World War. In addition the strategic view at the end of the war was that there would be no further wars to fight for the next ten years and development of fighter aircraft was therefore slowed. Military procurement has hardly progressed to this day, as a youth I remember the long drawn out birth of the Nimrod reconnaissance aircraft, and more recently there have been mis-adventures with the commissioning of Chinook helicopters and new aircraft carriers. A second strand to the industry’s failure was the management and engineering approaches common at the time in Britain. Management stopped for two hours for sumptuous lunches every day, it was often autocratic. Whilst American and French engineers were responsive to the demands of their potential customers, and their test pilots the British ones seemed to find such demands a frightful imposition which they ignored. Finally, with respect to civilian aircraft, the state owned British Overseas Airways Corporation was not particularly patriotic in its procurement strategy. Hamilton-Paterson’s book is personal, he was an eager plane-spotter as a child and says quite frankly that the test pilot Bill Waterson – a central character in the book – was a hero to him. This view may or may not colour the conclusions he makes about the period but it certainly makes for a good read, the book could have been a barrage of detail about each and every aircraft but the more personal reflections, and memories make it something different and more readable. There are parallels with the computing industry after the war, but perhaps the most telling thing is that flashes of engineering brilliance are of little use if they are not matched by a consistent engineering approach and the management to go with it.